Rosen Plevneliev is the fourth democratically elected President of the Republic Bulgaria. 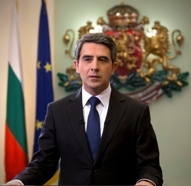 In the Bulgarian presidential elections, held in November 2011, Rosen Plevneliev was elected President of the Republic of Bulgaria. On 22 January 2012 he was inaugurated as the fourth democratically elected Bulgarian president, for a five-year term in office. President Plevneliev was awarded “Politician of the Year” in Bulgaria for 2011 and 2012 and bearer of numerous international awards.